When shopping for the girl who has everything, it can be challenging to come up with a creative, stylish gift that she’s guaranteed to love. That’s where personalised gifts come in. A customised touch, such as an engraved name or monogrammed initials, can turn an ordinary item into something truly special. Click through for 17 personalised gifts we think any girl would appreciate and cherish forever. 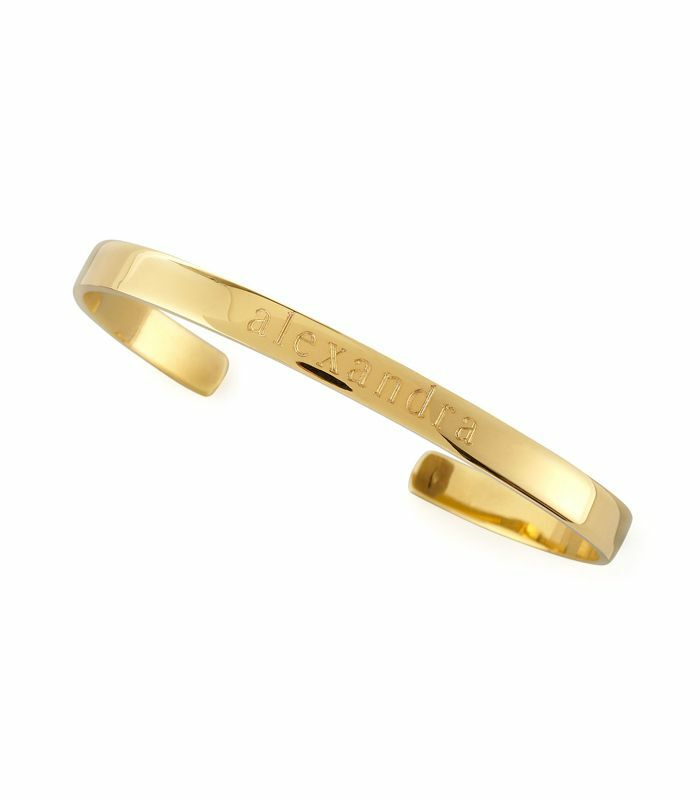 You can have any name engraved on this sleek bangle, understated enough for everyday wear. This bright blue pouch offers the perfect pop of colour. A monogrammed luggage tag makes a sweet stocking stuffer for the jet-setter in your life. These rings let you combine any two birthstones on one beautiful, dainty piece of jewellery. Not only can you fully customise every aspect of a pair of Jimmy Choos, you can also monogram them with metal initials under the sole. The standout outerwear piece of the season can belong to anyone, thanks to Burberry’s monogramming service! This Coordinates Collection necklace (customised with the coordinates of your choosing) makes for a sweet, sentimental gift. This chic catch-all is an excellent addition to any desk or vanity. These borrowed-from-the-boys PJs can be monogrammed for a thoughtful touch. These tiny studs come in all the letters of the alphabet. Treat the writer or artist in your life to this adorable pencil pouch, monogrammed with their initials. We love this limited-edition pouch, and the monogrammed letter only makes it better! Le Bloc lets you choose up to three letters to customise a cute bracelet or necklace. Hand-monogrammed jeans will be sure to please any denim lover. This classic belt will never go out of style, so it only makes sense to have it personalised via Madewell’s easy online system! This friendship bracelet looks even better with you and your BFF’s initials engraved on it. Vianel’s awesome cardholders are even better with a personalised touch. Which of these gifts would you most love to receive? Tells us in the comments!